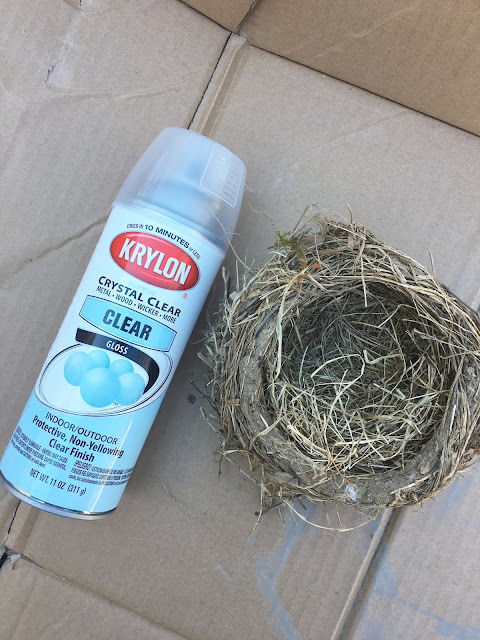 Disclaimer: If you do see a bird's nest in your yard or near your home, I would suggest waiting as long as possible to be sure that you won't disturb nature. 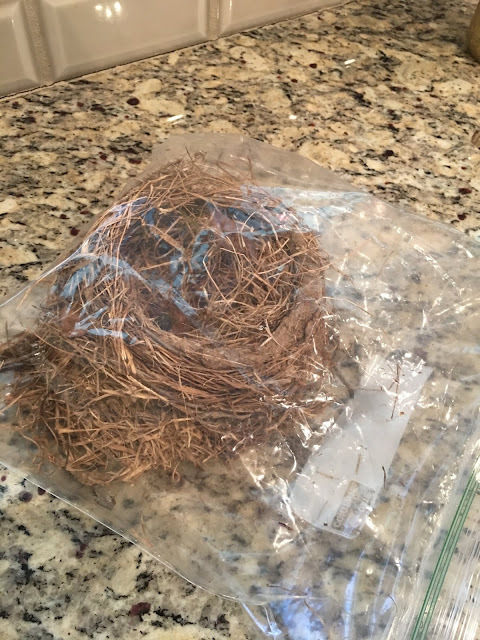 In all of my research for this project I learned that the Migratory Bird Treaty Act actually makes it illegal to disturb a nest of any native bird without a permit and that it is illegal to move or remove active nests, even if they are in an inconvenient location. However, after you are sure it is safe to remove a nest without causing harm, if you want to preserve the nest, I've done all the research of how to do that properly! Yesterday I shared some of my Spring and Easter decor, including my new additions this year. 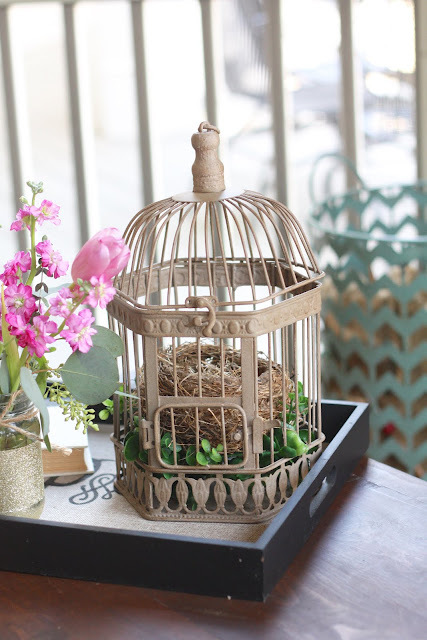 I'm so pleased with the way the birdcage turned out and I turned to my favorite design friend, Pinterest, with tips on how to style it. I ultimately decided I wanted to try to put a real bird's nest in it. Over a year ago a bird built a nest on our front porch and I just loved walking out my front door each day and peeking at the nest with her sitting on it waiting for her eggs to hatch. All of the sudden one day she was gone and I was hoping to find signs that the eggs had hatched, but she just kind of vanished and there were never any signs of babies. I'm not sure if my noisy kids were too much for her or if it was just such a high-traffic area that she decided to abandon ship and build a nest somewhere else. Or, for all I know, maybe her babies left the nest after they hatched and I just didn't notice. I guess we'll never know. What I do know is that the nest sat there for over a year and while I was always curious, I didn't want to disturb it in case she or any other birds ever came back to this spot. 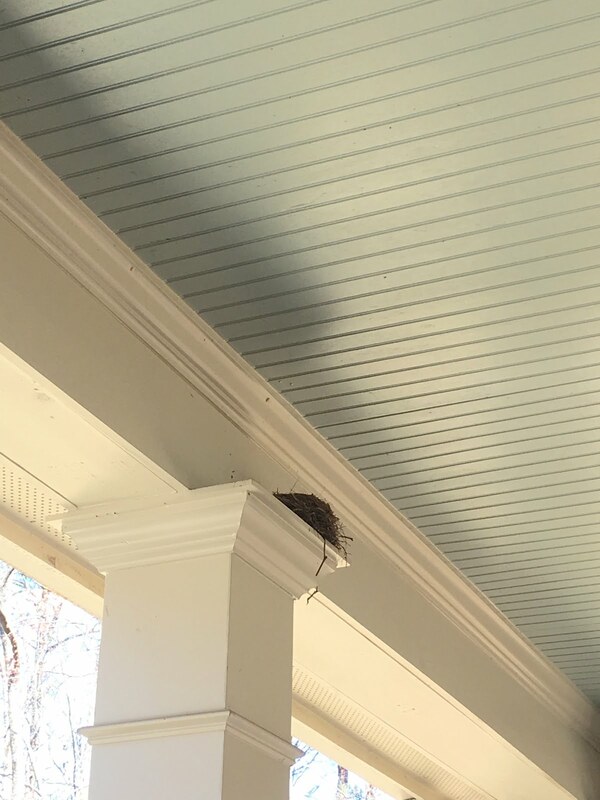 I did a little reading about nests and birds and learned that sometimes other birds will come and use a nest that has already been built. Because of this I left it on our porch for a really long time, but after over a year I decided it was safe to move it because no birds were coming. I was actually really scared to touch and move it. I don't really do nature and I guess I was kind of afraid of what I would see in the nest. Much to my surprise, when I went to take it down the thing was stuck up there. Like literally stuck to the top of the column with mud. Those birds are so dang smart. In all of my research I learned it takes about 180 trips per day for anywhere from 2-6 days to gather materials and build the nest. When I finally got it down I examined it and was in awe of the construction of the nest. I read that you should put it in a large plastic bag and then put it in the freezer for several days or up to week to kill any bugs or other tiny living things that might be living in the nest. I also read that these things usually leave shortly after a bird leaves and since my nest had been sitting here for so long I thought it might be OK, but it couldn't hurt to freeze it for a while. Next I sprayed it with a clear coat spray paint to sort of seal it and let it dry in the sun for a few hours. Then my nest was ready to put into the birdcage. 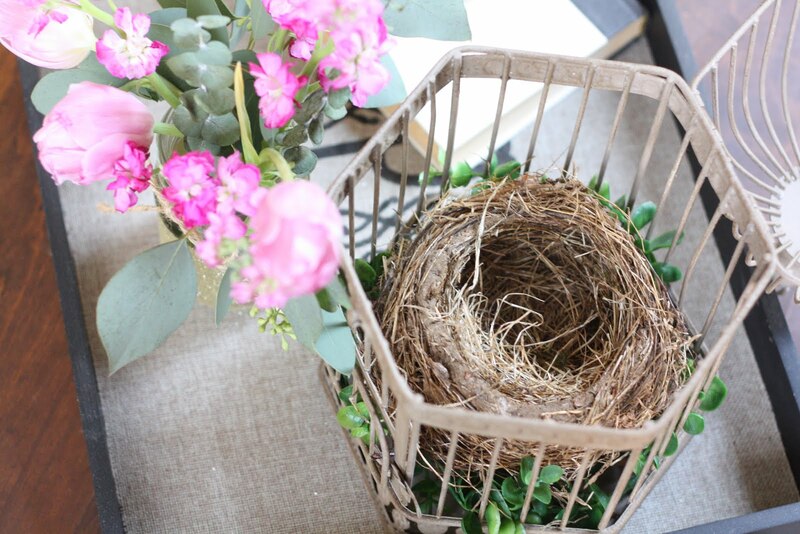 However, the color of the nest was pretty similar to the color of the bird cage so I used a faux boxwood stem on the bottom of the birdcage to really make the nest noticeable. 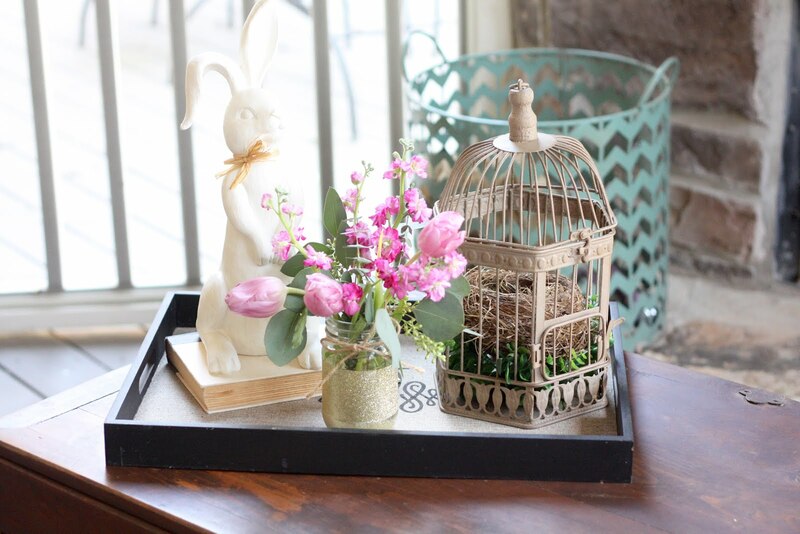 I'm so happy with the way this project turned out and I just love the special touch of spring that this adds to our porch! I also love that this nest was home to a bird (and maybe her babies) for a few weeks and that now it is a part of my home.